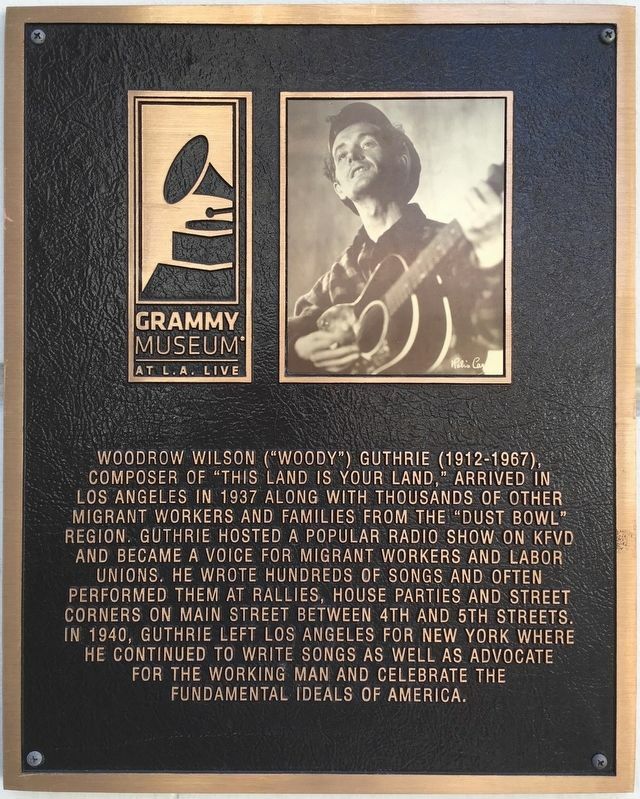 Woodrow Wilson (“Woody") Guthrie (1912-1967), composer of "This Land is Your Land,” arrived in Los Angeles in 1937 along with thousands of other migrant workers and families from the "Dust Bowl” region. Guthrie hosted a popular radio show on KFVD and became a voice for migrant workers and labor unions. He wrote hundreds of songs and often performed them at rallies, house parties and street corners on Main Street between 4th and 5th Streets. In 1940, Guthrie left Los Angeles for New York where he continued to write songs as well as advocate for the working man and celebrate the fundamental ideals of America. Location. 34° 2.88′ N, 118° 14.829′ W. Marker is in Los Angeles, California, in Los Angeles County. Marker is at the intersection of 4th Street and Main Street, on the right when traveling east on 4th Street. Touch for map. 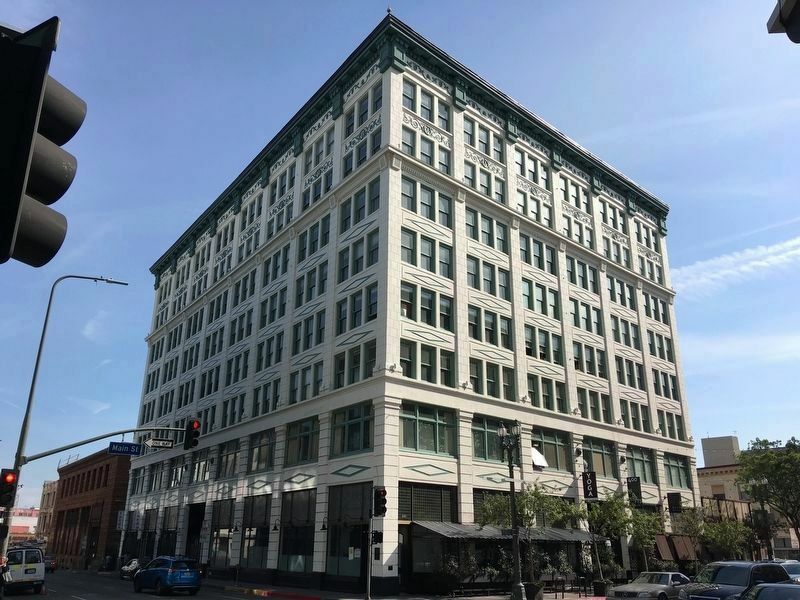 Marker is at or near this postal address: 400 S Main St, Los Angeles CA 90013, United States of America. Touch for directions. in a direct line); Bradbury Building (approx. 0.2 miles away); Historical Site (approx. 0.3 miles away); Old Ironsides (approx. 0.3 miles away); Pershing Square (approx. 0.3 miles away); Angel’s Flight (approx. 0.3 miles away); St. Vincent Court (approx. 0.4 miles away); Oviatt Building (approx. 0.4 miles away). Touch for a list and map of all markers in Los Angeles. More about this marker. 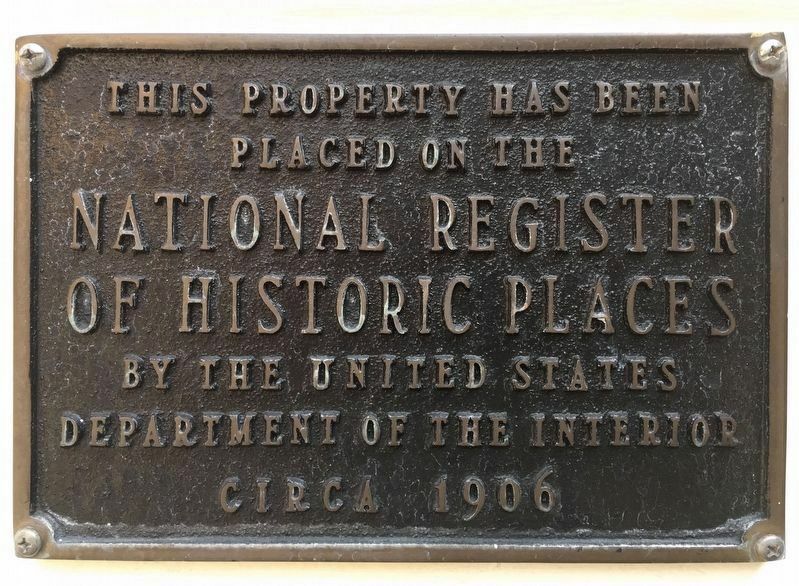 This marker is on the San Fernando Building, built by J.B. Lankershim in 1907, listed in the National Register of Historic Places in 1986, and designated Los Angeles Historic-Cultural Monument #728 in 2002. 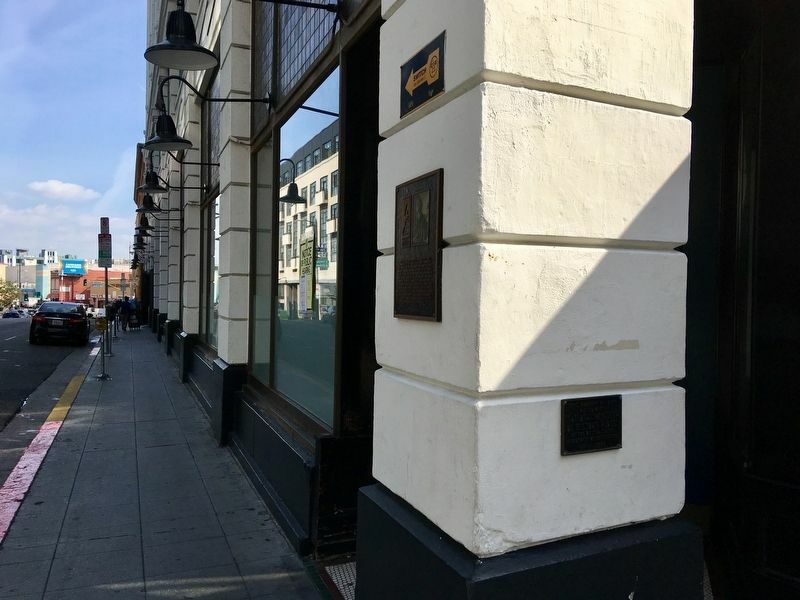 The marker is on the corner of the building. “Songwriter, poet, voice of the Dustbowl refugees.” City Hall can be seen in the distance. More. Search the internet for Woody Guthrie. Credits. This page was last revised on March 25, 2019. 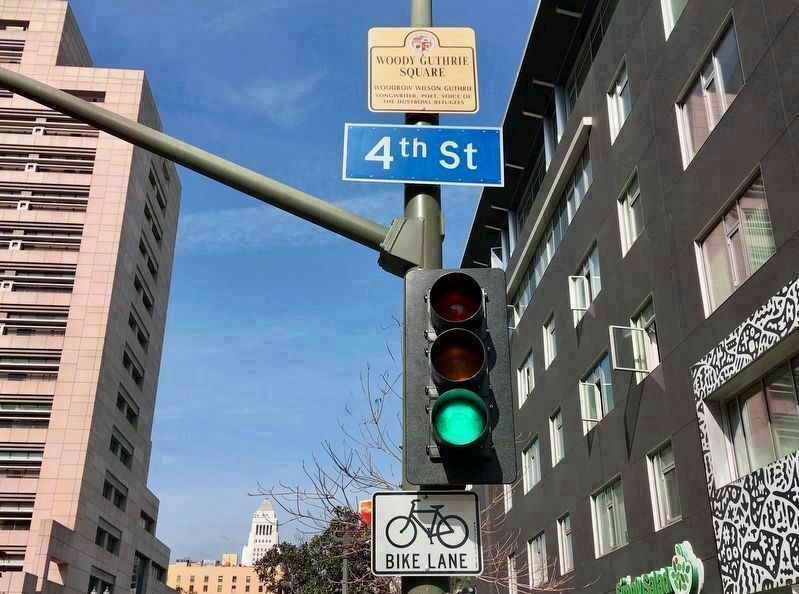 This page originally submitted on March 23, 2019, by Craig Baker of Sylmar, California. This page has been viewed 25 times since then. Photos: 1, 2, 3, 4, 5. submitted on March 23, 2019, by Craig Baker of Sylmar, California. • Andrew Ruppenstein was the editor who published this page.